Disney’s retelling of the classic story by Hans Christian Anderson, The Little Matchgirl concerns a young Russian girl trying to peddle her wares (in this case, a handful of match sticks) to Christmas shoppers as they traverse a busy, snow-covered street. 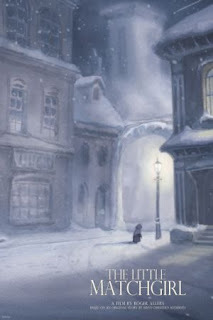 When night falls, the little girl (who didn't sell any of her matches) makes her way to a back alley, where she rests, shivering in the snow. To keep warm, she decides to strike some of her matches, and when she does so, she sees images of the idyllic life she so desires dancing in the flames (including a warm fire, a fully-decorated Christmas tree, and her beloved grandmother, who gives her a loving hug). By the end of the film, the little girl has used up all her matches, but does get to experience the good life which, moments earlier, had filled her dreams. Visually, The Little Matchgirl is quite stunning, opening with darker hues to establish the cold, cruel world that passes its title character by, then utilizing warmer colors when she fantasizes about her old home, and the grandmother who obviously loved her. Yet what truly impressed me about this short was its musical score, which consisted of a piece written by Aleksandr Borodin, the 19th century Russian composer, titled "String Quartet #2 in D Major: 3rd Movement: Notturno". Performed by The Emerson String Quartet, this somber, elegant tune proved the perfect match for the material, and was every bit as beautiful as the images parading before our eyes. Like Lorenzo and a few of the others movies in The Disney Short films Collection, The Little Matchgirl contains no dialogue, but with its delightful story and superb score, it nonetheless speaks volumes. I think it's time Disney started making 2 films, one for the kiddies and one of the real story.